Walking is a great way to help maintain your level of fitness. It certainly beats sitting on the couch!It’s easier on your joints than running. Additionally, since it’s a weight bearing exercise, it helps strengthen your bones and muscles. 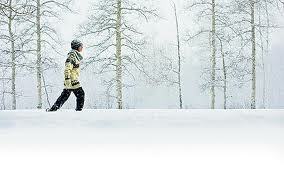 Walking outside in the winter is very effective as your body needs to work harder to maintain its core temperature. Increase the pace a bit and you’ll get an aerobic workout. If the cold is not your thing, now that Spring is upon us your running out of excuses! Stretch and warm-up before you begin. Wear appropriate clothing and dress in layers. Swing your arms so that your upper body is also involved. Walk with an upright posture, always keeping your core engaged. Alternate moderately paced walking with periods of speed walking. Stay hydrated during your walk. At the end of your walk, be sure to stretch and cool-down. Walking is not just for those warm summer months. Finding a challenging trail or a simple walk through the neighborhood is a surefire way to burn a few calories when you are not up for a full gym workout. Remember, making a relatively small investment of time and energy can reap tremendous rewards. This exercise uses large muscle groups continuously which can dramatically improve your aerobic fitness. Here are a few of the potential benefits of walking for 10 minutes two or three times a day or 20 minutes once a day. To return from the walking page to the Fitness Tips page click HERE.